Over the period of the past five or six years, my work has been focused on the effects of agriculture on the environment, and often has been entwined with community based projects. The intention of these works has been to serve as an invitation for dialogue on this topic and its many tangents. I have functioned as both the principle artist producing works for exhibition and as the initiator of open-ended,interdisciplinary projects. These projects start out as personal painting inquiry and often evolve into collaborations with other artists, students, or community members as creative responses to key environmental concerns. 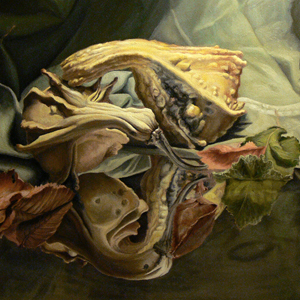 The painting "Animal or Vegetable l" is one such of example of these inquiries. It represents a beginning series of personal work that has grown out of an earlier collaborative project entitled "Crop Circle." The "Crop Circle" project was a community based art endeavor that involved promoting awareness of local farmers utilizing organic processes. Formally I am interested in the destabilization of the perceptual space contained within the still life. This specific variety of gourds, which have been hybridized throughout history for their vibrant color and diverse forms, are of particular interest as a subject to me. My choice in observing their condition in a state of decay, is a subtle insinuation to the to the current manipulation of food crops by genetic modification. The figurative quality of the vegetable metaphorically destabilizes one's perception of what is plant and what is animal. As with all of these initial visual inquiries it remains to be seen what narratives the painting chooses to bring to surface and where they will evolve from there.